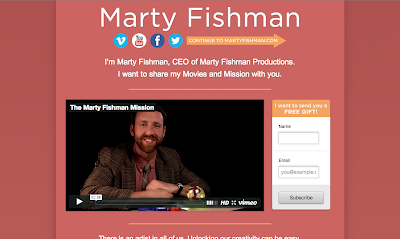 Marty Fishman: New Website. New Video. New (Fish)Man. New Website. New Video. New (Fish)Man. It took months of thinking, coding, and editing to get this puppy ready. You are on it right now. We've revamped the Marty Fishman Website! And when a new chapter begins, there should be lots of gifts involved. We've created a new Welcome Video, Chronicled our Past Work, and written a wonderful book: Marty's 5 Tips to a Creative Life. MartyFishman.com is a home for all of our creative endeavors as well as scientific findings relating to the Creative Process. Feel free to swim around the site and hopefully you are inspired to make some fun projects with your friends.